We’re pleased to announce the inaugural contribution to our Memorial Donation program: a sizable gift honoring the life of Marcy Westerling. 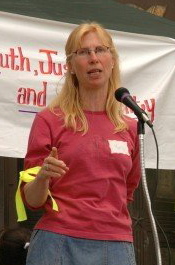 Marcy Westerling, founder of the Rural Organizing Project, died on June 10th after “livingly dying” (as she called it on her widely-read blog) with Stage IV ovarian cancer for over five years. She was a force to be reckoned with: fiercely smart, brave and bold, profanely funny, strong and determined. She brought these same qualities to her life as a cancer warrior. Her terminal cancer diagnosis was part of what inspired me to become a Life-Cycle Celebrant, to co-found the PDX Death Cafe, and to dream up this event. When her family asked how they could thank me for officiating her burial service, I suggested a memorial donation to Death:OK, to continue Marcy’s work of breaking taboos around talking about dying. The generous memorial contribution from Marcy’s family will allow 25 of our amazing presenters to attend the full event at no cost – but that’s only half of them. We need your help to go the distance in covering costs for this uniquely special one-time event. We’ve kept ticket prices crazy low to make sure the event is accessible to all. That means we won’t break even without the support of community donations. Death:OK is an independent, community event reliant on ticket sales and tax-deductible donations to cover our costs. Taking our cue from the 200 people who completed our community survey, we’ve steered away from depending on the marketing budgets of corporate under-writers or fees from vendors seeking to boost sales. We’re inviting everyone who supports the mission of our event to be a part of making it happen with a donation. We need to raise $5,000 from community donations and right now are at $1,500. You may designate your donation in memory or honor of someone – a beloved person, pet, or community. Honored names will be incorporated into a beautiful memorial display at the event. Memorial donations of $100 or more may be recognized by naming a room at the event for the honoree. Once you’ve made your donation we’ll be in touch to confirm memorial designation details. Make a memorial donation today. Alternatively, consider buying a Pay It Forward Ticket to fund the participation of a volunteer or presenter. Donations are tax-deductible thanks to our 501(c)(3) fiscal sponsor, the White Eagle Memorial Preserve and the Sacred Earth Foundation. Having Marcy’s story be a part of Death:OK makes the event even more meaningful to me. I look forward to hearing the stories of your honored loved ones as you make your memorial donations in support of a healthier culture for all of us.